Tamaño de esta previsualización PNG del archivo SVG: 800 × 560 píxeles. Otras resoluciones: 320 × 224 píxeles | 640 × 448 píxeles | 1024 × 717 píxeles | 1280 × 896 píxeles | 1000 × 700 píxeles. § 8-3-102. Adoption, use and specifications of state flag; penalty for misuse. a) A state flag is adopted to be used on all occasions when the state is officially and publicly represented. All citizens have the privilege of use of the flag upon any occasion they deem appropriate. The width of the flag shall be seven-tenths (7/10) of its length; the outside border shall be in red, the width of which shall be one-twentieth (1/20) of the length of the flag; next to the border shall be a stripe of white on the four (4) sides of the field, which shall be in width one-fortieth (1/40) of the length of the flag. The remainder of the flag shall be a blue field, in the center of which shall be a white silhouetted buffalo, the length of which shall be one-half (1/2) of the length of the blue field; the other measurements of the buffalo shall be in proportion to its length. 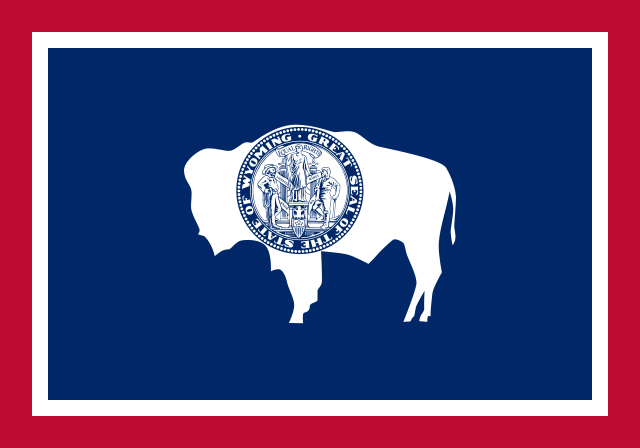 On the ribs of the buffalo shall be the great seal of the state of Wyoming in blue. The seal shall be in diameter one-fifth (1/5) the length of the flag. Attached to the flag shall be a cord of gold with gold tassels. The same colors shall be used in the flag, red, white and blue, as are used in the flag of the United States of America. Fuente Trabajo propio: It is from openclipart.org, specifically usa_wyoming.svg, by Caleb Moore. Los trabajos en el dominio público deben haber expirado su copyright en los Estados Unidos y en el país de origen para ser subidos a Commons. Si el trabajo no es un trabajo estadounidense, el archivo debe tener una marca de derechos de autor adicional indicando el estatus del copyright del país de origen. Este archivo es de la Open Clip Art Library, quien lo liberó bajo dominio público, usando de la licencia Creative Commons la dedicada al dominio público. Al usuario: Por favor dé el enlace donde la imagen proviene.